September 4th was a big day for Airship La Marianne. Today the crew members voted unanimously to accept the airship bylaws. After voting we went out together and celebrated by going to see a Steampunk production of Sherlock Holmes and the Crucifer of Blood at Theater 3 followed by a wonderful dinner at a local restaurant with fellow steampunks. 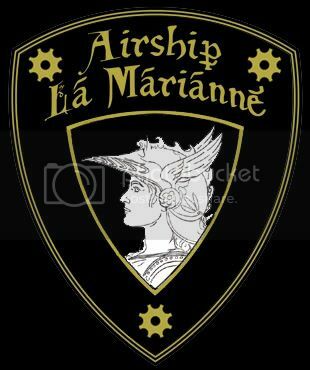 Congratulations on the successful launch of Airship La Marianne! The Professor and I were delighted to share your celebratory dinner.